When you are having problems with your sewing machine, the first step is to change the machine needle. 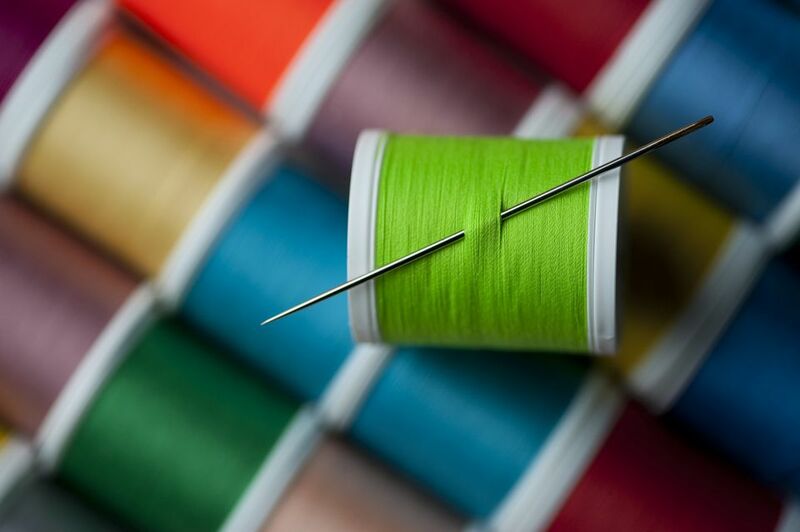 If you are still having problems, the next thing to question is whether you are using a good-quality sewing thread. As thread is guided through the sewing machine it passes through many eye openings and through tension disks. All the places that the thread travels have a purpose in maintaining the sewing machine's tension. In most of the newer machines, the tension disks are hidden inside a plastic cover. This protects the disks from dust and damage, but it also does not allow you to see what may be happening. If you aren't purchasing quality thread, you may be damaging the disks. Eventually, you could have problems with the machine maintaining an even tension as you sew. The debate among sewers about which thread is best often makes long discussions about what thread is the best. It's a balance of being thrifty but wanting a quality finished product. What is the difference between different qualities of thread? A home experiment is to get a 60X microscope and look at the different kinds of thread you have in your sewing basket. As you view the various types of thread, think about how the thread passes through fabric and how the loose fibers, being stuck in the fabric, will weaken what is left of the thread. Seeing is believing! Are you going to take the chance on the investment you have made in a sewing machine and the time element that you invest in making any item? Here are notes for several types of thread as viewed under the microscope. Here they are grouped for those showing loosely wound thread or stray fibers. Excell 100% Polyester: It was purchased from a five-for-a-dollar bin. It is hairy with loose fibers that can cause problems. That may explain why it was so inexpensive. Lucky Strike 100% Cotton Thread: The fibers are wound loosely and there are many stray fibers. Coats And Clark Dual Duty - All Purpose Thread: This one had many loose fibers that can knot and wear at a sewing machines' tension disks, as well as cause weak spots in the seams. Trusew 100% Spun Polyester: It was purchased from a bargain bin and had excessive loose fibers throughout the spool. Talon Superlock 100% Spun Polyester: Although the quality is better than the bargain brands, this cone spool of serger thread had more stray fibers than it should. Mettler's Silk Finish 100% mercerized cotton: There were very few loose fibers. Coats And Clark 100% cotton thread: This one was almost completely smooth under the microscope, a tightly-wound thread without stray fibers. Guttermann 100% polyester thread: This is one of the more expensive threads on the market and has far fewer loose fibers than the bargain brands. Mettler Metrosene Plus 100% Polyester: Very few loose fibers. There was a visible difference between a cheaper thread and more expensive threads. Although this was not a scientific analysis, it could persuade you to use better thread to keep your sewing machine happy.